© 2019 Christopher P Jones. When artists adopt, do they also oppress? The first time I visited the Museum of Modern Art in New York I was twenty-four years old. The museum was under renovation at the time and had been temporarily opened in a building in the suburb of Queens. A much smaller venue, it provided only a glimpse of the full breadth of work the museum had to offer, so only the most important works were on display. I didn’t know it when I entered, but one such work was Pablo Picasso’s Les Demoiselles d’Avignon. Hardly had I been there three minutes when I saw the picture across the gallery hall. I rushed to it, babbling to my friend about its significance in the history of art. For the student of art history, there are few paintings that compare to Les Demoiselles d’Avignon for their historical significance. It was painted in 1907, and was part of Picasso’s experimentation in the early stages of Cubism. It is said to open the gateway to modern art. Yes yes. Haftmann has it just right, doesn’t he? The five figures in the painting — prostitutes of Avignon — are naked and baring fruit. Their faces are angular. Their limbs barb and jar against the edge of the picture frame. They seem to hold open the painting as if a curtain would descend if they retreated. Since I was studying and making art at the time, I was thrilled to see this painting face-to-face. For the previous few years I had been enchanted by the art movements that were born out of Les Demoiselles d’Avignon, the Cubism of Picasso and Braque, and Jean Gris, Fauvism, and then later, the Futurism of Boccioni, Balla and Feininger. I loved the technicality of the shapes, as they were, overlapping facets of the same object, shattered and then reassembled in an intersection of triangles and rhombuses, or parabolas and ellipses. I understood how the whole pursuit — Modernism with a capital ‘M’ — paved the way for abstraction in painting; and my own conception as a painter too. In truth, I grew away from Picasso’s early benchmark. Nevertheless, or probably because of this, I maintained a tacit and significant respect for it. My art history teaching would not let me forget its place, but more than this, just as the painting refers to ‘primitive’ motifs for its expression, I regarded the painting as the rudimentary forerunner to the more sanitized and controlled movements of Cubism and Futurism. I had a kinship with these movements, but Picasso’s painting was like an ancestral shadow that I dared not question nor attempt to fully understand. In 1907 Pablo Picasso was 26 and had been living in Paris for three years. He was living at a time when numerous European countries —France included — were expanding their imperial reach. As colonies in Sub-Saharan Africa were established, so African artworks were being brought back to Paris museums to be gazed at and pondered over. It is uncertain whether it was in May or June of 1907 that Picasso experienced his “revelation” — either way, Les Demoiselles d’Avignon was begun in May 1907 and reworked in July of that year, so there can be no doubt about the connection. One just need to look at the two figures on the right hand side of the composition and their mask-like faces. Both have diagonal lines running across their cheeks like grooves carved in wood. Their noses are elongated and concave, constructed of a strip of white running from the bridge to the tip. Most of all, the jaw-lines are exaggerated, unnaturally round and distended. What was Picasso doing here? In borrowing motifs from the tribal art he saw in the Trocadero, was he being ‘influenced’ by African art? Or did he perform a more pernicious act, that taking from a culture that didn’t belong to him – and in doing so, rehearsing the centuries-old romanticizing of ‘primitive’ peoples, as if the colonial enterprise had discovered a more natural expression than “civilized” or modern man could achieve? How should we feel when we look at painting like Les Demoiselles d’Avignon? The OED defines cultural appropriation as the taking over of creative or artistic forms, themes, or practices by one cultural group from another, especially Western appropriations of non‐Western or non‐white forms, which carry connotations of exploitation and dominance. 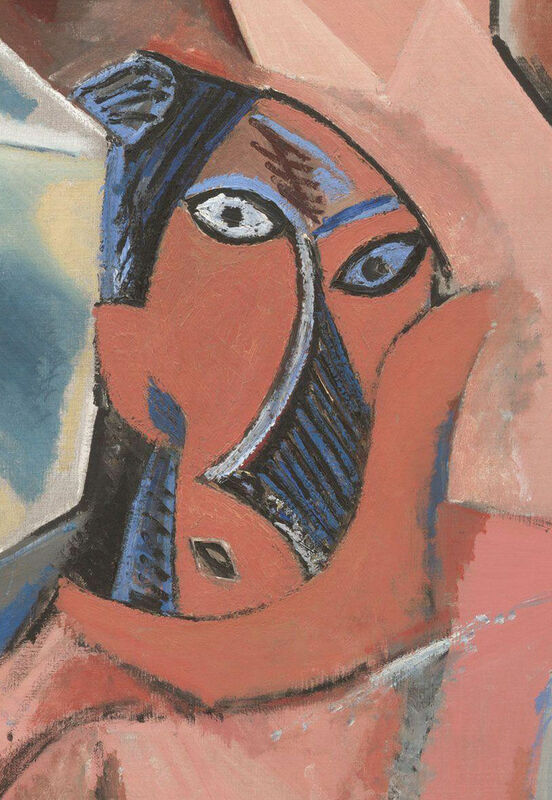 Certainly, Picasso was living through a cultural moment when the realities of modernity led some to idealize an alternative, retrospective tradition — a moment which, arguably, we have not yet emerged from. An influence on Picasso, for instance, the painter Paul Gauguin had taken up residence in the French colony of Tahiti and had begun to use Tahitian models and emblems in his art. In 1984, The Museum of Modern Art (MOMA) held a first-of-its-kind exhibition called ‘Primitivism’ in 20th Century Art: Affinity of the Tribal and the Modern. The show contained more than 200 tribal objects from Africa, Oceania and North America, and placed them alongside works of modern art by the likes of Gauguin, Picasso, Constantin Brâncuși and Paul Klee. The MOMA exhibition proposed that these modern painters found a new beauty and complexity in these tribal pieces, “previously considered mere curiosities.” At its heart, the exhibition sought to downplay the cause-and-effect connection between modern European artists and the tribal objects from Africa, Oceania and North America. Instead it proposed natural ‘affinities’ between them, as if both had found some natural wellspring of creative expression which the museum was objectively comparing. Picasso’s Les Demoiselles d’Avignon continues to take pride of place within MOMA’s halls. Should we admire it or question it? When it was made, the painting was experimental and revolutionary, a bold stylistic challenge not only to Picasso’s own oeuvre but to contemporary art in early 20th century Paris. As such, it stands as a point of departure for much of modern art. Artists since Picasso have used appropriation as an meaningful artistic technique, first begun by Picasso and Georges Braque in their cubist collages made from 1912 on, when they included real objects such as newspapers in their work. 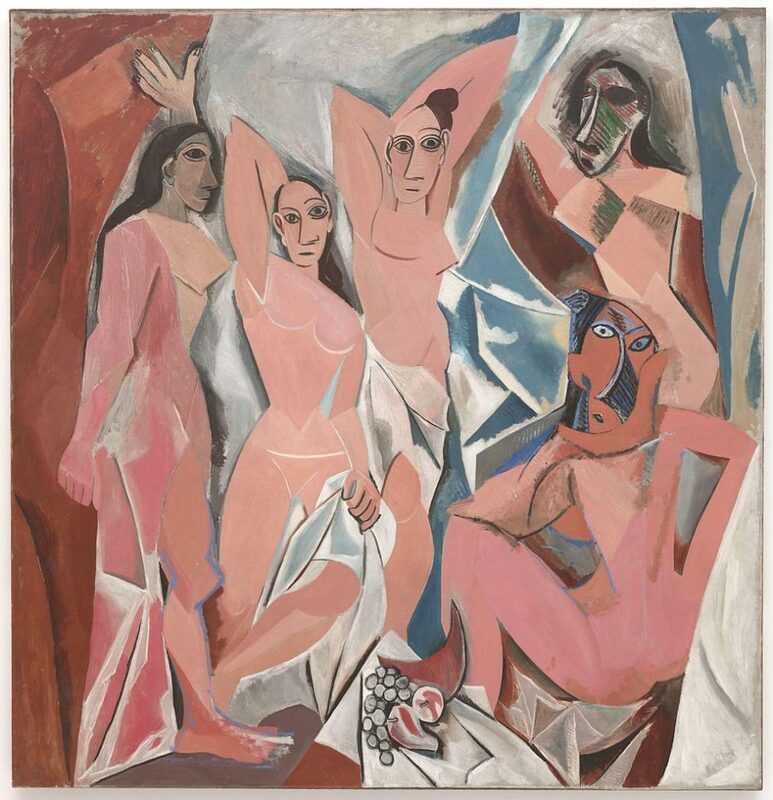 Whilst Les Demoiselles d’Avignon, strictly speaking, falls outside of the innovation of appropriation, it maybe considered as a legitimate precursor. For me, a difficult question remains: Is it possible for an artist to ever adopt elements from a different, especially minority, culture without betraying the values that the recognition of cultural appropriation seeks to establish? When I think back over my relationship with this painting, I am led to wonder what affinities I share with the work and the artist. It was never my favorite painting — I never accustomed to the confrontation posed by the effects of the composition: it was too rugged and somehow too belligerent for my young tastes. Yet it has had a decisive effect on my ‘mental map’ of art history, and my conception of Modernism as compelling chapter in the story of art. In short, my excitement about the painting still remains. In this judgment, I realize I am letting Picasso and the broader story he symbolizes continue to occupy the center-field; in this respect, I let the appropriation of the Trocadero artefacts persist un-shamed (if a little deconstructed). In conclusion, if Picasso work does indeed coincide with what Hal Foster calls “the fetishistic recognition-and-disavowal of the primitive difference”, then it also resists being divested of the remainder of its numerous qualities.